Spring Break = Spring Sewing! New quilts to welcome the sunshine. Spring Break! Woo-hoo! I've spent the past couple of days prepping for our family's spring break getaway. Laundry, shopping, packing... Nah! I'm talking about prepping my road trip sewing projects! I've cut and glued a couple of wool blocks together ready for some applique and even have a quilt ready to finish with some hand binding. I'm looking forward to some "pieceful" handwork just as much as I'm looking forward to basking in the warm desert sun in the southern Utah wilderness. I often get more done in the car on these long drives than I do at home and there's nothing more calming to my mind than stitching next to the campfire in the evening. I know I'm not the only one who sees spring break as a chance to sew! We've enjoyed seeing lots of spring breakers making their way into the shop this week. So many fresh projects in the making! Here's to finishing out spring break with spring sewing! ...and if you don't get to finish up projects like you had hoped, join us at our Sew-It-All Weekend next week, April 12-13! The quilting fun never ends around here! 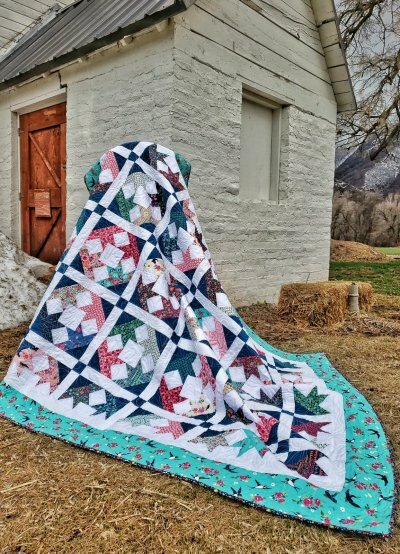 The Rosa collection by Crystal Manning of Moda had my heart the moment it came through our door but Stacey Giles really made it into something stunning using the Basket of Blooms pattern found in the BLOCK publication by Missouri Star Quilt Co. Striking color combinations bloom while birds soar over head. 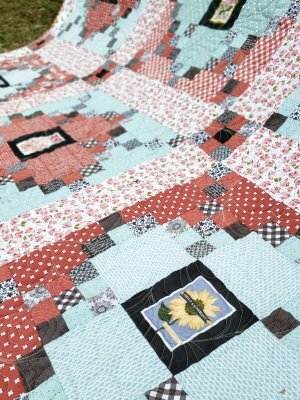 It's a tranquil spring garden in a quilt. Machine quilting by Emily Herrick. Kits and yardage available here at the shop! Where all your seams come true. Join us and twelve more quilt shops along the Wasatch Front for four days of shop hopping fairy tale magic! $5 passports go on sale April 15th at any participating shop then get ready for fun shopping, games and prizes at the hop, May 29th - June 1st. Visit utahshophop.com for a list of participating shops and exciting prizes! Remember a week or two ago, I introduced you to a fun new fabric brand, Poppy Cotton? 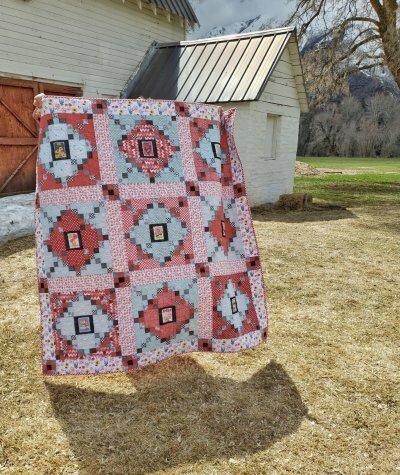 Chris Chamberlain wasted no time piecing this country flavored quilt using the Prairie Sisters collection from Poppy Cotton. She selected a pattern by Deb Strain titled Bee Inspired and featured the prettiest little seed packets in the center of each block. She has plans for her own matching set of curtains in her kitchen but before she wisks this quilt away, stop in and see it in person, grab a kit and see just how fabulous this whole new fabric line is. Quilter's Corn-er April is here and we have an exciting Motif-of-the-Month to announce. CUSTOM! You heard me right! 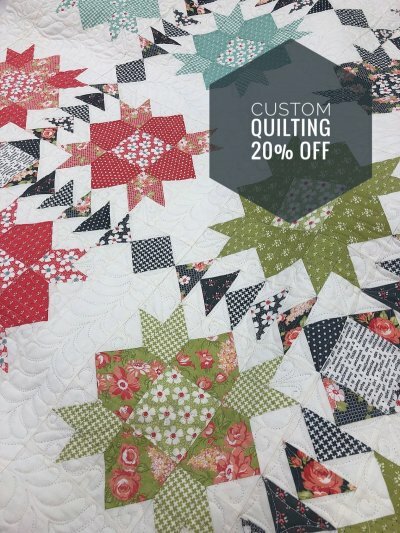 Through the month of April, any custom machine quilting design is 20% off the regular price of quilting service! Because our long-arm quilting machines are hand guided, Ramona and Emily can quilt custom designs into individual blocks and borders and boy are they talented! Custom quilting can be modern or traditional. You might want to echo applique, mimic a vintage design or use a motif in your fabric as inspiration. It's time to think about finishing graduation quilts! Custom quilting a photo or t-shirt quilt allows for enhancing those focal points. Ramona recently quilted this incredible quilt made by Julie Hancock using custom motifs addressing each block for a classic look. Bring your quilt top in and talk with one of our quilter's for design ideas that will finish your quilt perfectly! Doors open at 9:00 a.m. for those registered in this mystery block of the month. First demo begins at 9:15 a.m. and repeats every 30 minutes. Last demo begins at 12:45 p.m. You won't want to miss this month's exclusive special! Monday, April 8th - 25% off MINKY & CUDDLE FABRICS! Join us to work on your own wool projects and get help with them when needed, every 2nd Tuesday, 1 p.m. - 3 p.m. In this club we will explore new projects and techniques using wool. Wool applique, primitive rug hooking, whatever wooly projects you enjoy, this is a great opportunity to learn something new, relax, and make new friends who love working with wool just as much as you do. $15 for four months. Register in-store or online. Saturday, April 13th 10:00 a.m. - 7:00 p.m.
Are you a “Sew-It-All”? We want all of our Sew-It-All friends to join us as we Sew-It-All Weekend! $65 includes lunch both days so you can sew non-stop at our retreat center. You will also receive a Sew-It-All pass good for exclusive discounts at the shop during the event! Bring ANY sewing project that needs finishing and Chris & Jen will be there to lend advice and help you trouble shoot. With two whole days dedicated to finishing projects you really can be a Sew-It-All!